JON GNAGY ART STUDIO SET. A generous assortment of art supplies and instructional materials to learn drawing, watercolor painting, and oil pastels. All packed in a handy reusable storage tray. Non-toxic. Ages 8 to adult. 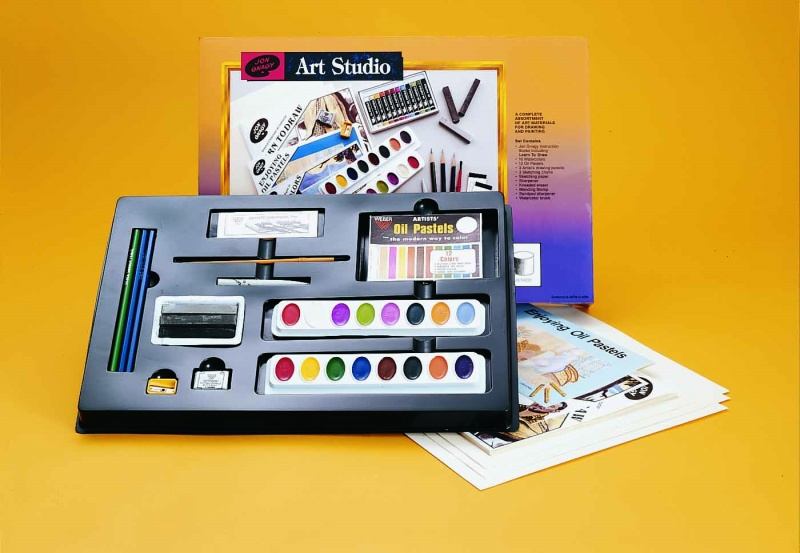 The set includes 12 oil pastels, 16 cake watercolors, 3 sketching chalks, 3 art pencils, sketch paper, kneaded eraser, sand pad sharpener, blending stump, paint brush, pencil sharpener, "Learn to Draw" by Jon Gnagy, Oil Pastels, and Basic Drawing Booklets.